Running back stock watch: Who's up? Who's down? Published: Dec. 23, 2018 at 03:57 p.m.
Houston Texans quarterback Deshaun Watson keeps play alive finding running back D'Onta Foreman out of the backfield for 20-yard touchdown. Published: Nov. 19, 2017 at 04:01 p.m.
Houston Texans running back D'Onta Foreman rushes down the sideline for a 34-yard touchdown, but gets injury on the play and is carted off the field. Published: Nov. 19, 2017 at 03:38 p.m.
Houston Texans running back D'Onta Foreman rushes through Arizona Cardinal defenders to score a 3-yard touchdown. 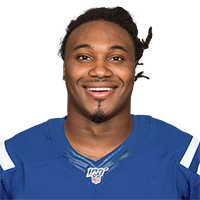 Published: Oct. 15, 2017 at 02:31 p.m.
Houston Texans running back D'Onta Foreman runs for 39 yards.